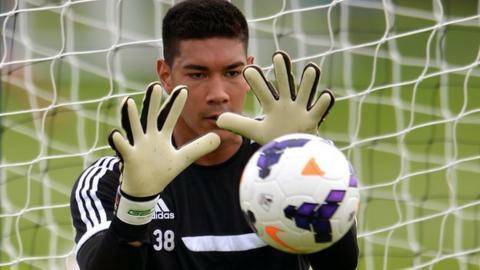 League One strugglers Crewe Alexandra have signed Fulham reserve goalkeeper Neil Etheridge on an emergency loan. The Alex have conceded 36 in 16 league games this season - the worst record in English football's top four divisions. And, having already used three keepers this season, boss Steve Davis has opted bring in a new face for Saturday's derby clash at home to Port Vale. The 23-year-old London-born Philippines international has previously been on loan at Charlton and Bristol Rovers. Having swapped this season between veteran Steve Phillips and Alan Martin, his understudy for the past two years, Davis turned to youngster Ben Garratt for Tuesday night's FA Cup first round replay at home to Wycombe Wanderers. But Garratt's error led to Wycombe's crucial opening goal as the Alex bowed out 2-0. Davis had already warned earlier this week, following last Saturday's 5-0 caning at Brentford, that his patience with his squad had run out. And, with highly-rated young striker Max Clayton likely to miss the rest of the campaign with a broken ankle, to add to the loss of last term's top scorer Mathias Pogba, who is yet to feature this season, Etheridge's arrival is likely to be followed by more new signings. "I hold my hand up," Davis told BBC Radio Stoke. "One or two of the people I brought in have not done as well as I thought,"
"We all make mistakes. The important thing is that you identify those mistakes and you try to put them right. "I've always been an advocate of the importance of good team spirit. There comes a time when you know something's not quite right. They're not giving enough or their attitude's wrong. "We've only won three games this season. That's nowhere near enough, given the standards I have set at this club. "Additions will help the group and give everyone a boost. "Had I gone with the current group as it was, it would have been a very long season."